Due to some sort of water supply problems Cult was unexpectedly closed this week. Instead we arranged an last minute change of venue to the very accommodating Pump & Grind. A fair few IpBoG regulars heard about the venue change one way or another and the night continued as normal. I'd brought along my game prototype that has the working title of The Five Families. Play-testing went down pretty well and feedback was mostly positive although Dan was understandable angry that he'd spent his time playing a game that there is no Boardgamegeek entry for so he was unable to log his play. Expect more play-testing over the next few weeks though. 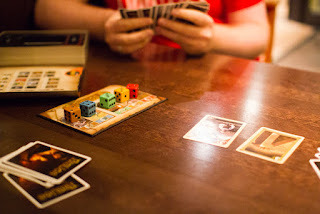 Afterwards I played Biblios. It finished in a tie with everyone on the same amount of points however Alex had the most money winning him the tiebreak and the game. Joanne had brought along her favorite game but she'd lost the box a long time ago and didn't know the title of it. It has something to do with numbers, that's all I know. I guess there was no Boardgamegeek logging of plays for this game either. Afterwards King of Tokyo got played. Johnny got eliminated pretty early on and the game took an unusually long time. Justine emerged victorious. This was followed up by a few games of Dobble. 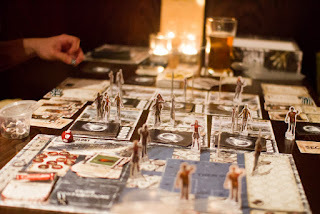 Another group was playing Dead of Winter. The main objective was completed as were all the personal goals of the good players. Only the traitor didn't manage to complete their objective. I'm sure by next week the water issue will be fixed and we'll be back at Cult as usual.